Many people think that Görlitz is not only the most beautiful town in Germany, but one big architectural work of art with a European format. The large heritage area offers both a rich history and a splendid presence. The city saw its greatest heyday in the early modern period thanks to cloth and woad trading. Due to the favourable location on the Neisse River and the Via Regia, a central European trade route leading from Kiev to Santiago de Compostela, Görlitz developed into an important centre of trade, culture, architecture and craftsmenship. Looking at the city today, the wealth of the past still surrounds you everywhere representing nearly every period of architecture and of the city’s development. Görlitz was not destroyed during World War II, however, until the political changes in Germany in 1989, the existing historical buildings were left to decay. German reunification was a blessing, especially for the Old Town. There has been an anonymous donor making a great contribution to the new upswing of the city. From 1995 to 2016, he or she has been donating the so-called Old-Town-million (today around 511.000 Euros) to the city every year to support restoration and make the city become one big gem. Presenting 4,000 monuments from the periods of Gothic, Renaissance, Baroque and the Wilhelminian era, the city today is more splendid than ever. It is the place, where the citizens of Görlitz find the basis to lead their lives, and at the same time, it is an attractive stage for numerous events. Every year on the third Sunday in September, visitors are invited to enter historical buildings, which usually remain concealed. Time for a walk through the architectural history. Visitors are especially fascinated by the houses in the Old Town with their richly decorated facades, elaborate vaults and painted ceilings from different periods of time. Nowhere else in Germany, but here, in the city on the Neisse River, you would find such a high concentration of carefully restored monuments of architecture. 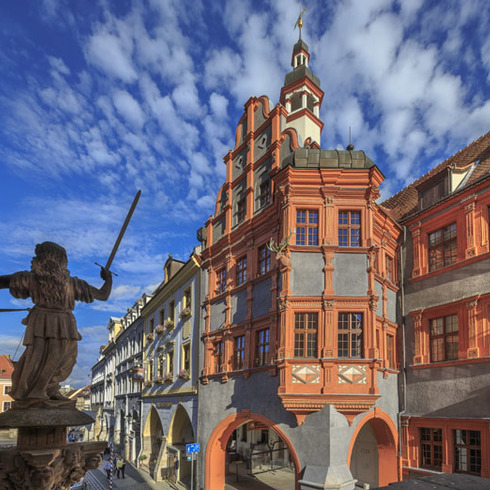 At the turn from the late Middle Ages to early modern times, an extraordinary type of town house started to develop in Görlitz – the so-called “Görlitz Hall Houses”. Owned by long-distant merchants, they were used as residences and private breweries, and at the same time, they served as trade and fair venues as well. Görlitz is a city of towers. Most of these towers used to be parts of the city fortification, and offer an impressive view even today. Fife of them are open to the public, and some of them invite you for a guided tour. It is a great experience to see the city from above, you can watch for hours, still discovering something new: small lanes, prominent buildings, or hidden backyards. It is probably the most beautiful tower of the city located at the most beautiful place in the Old Town, the Lower Market (Untermarkt). Visitors are welcome to explore the tower on a 1-hour guided tour, since there is a lot to discover in this building firstly mentioned in 1378: find out about the pillory and the executioner, about the clock indicating the phases of the moon and about the daily life of a watchman. The splendid clock is decorated with a watchman’s head, opening eyes and mouth every minute. The golden lion above roars to indicate the changing of the lunar phases. Having climbed up 191 steps, you can enjoy a fantastic panoramic view, standing at a height of 60 metres.